I had been to Beatty, NV once before, but only as a quick stop on a Death Valley tour I was doing with Matthew a few years ago. This second time I was on my way to Reno from Los Angeles (from one volleyball tournament to another), taking the scenic tour through the deserts of western Nevada to do some peakbagging in the middle of the week. The mountains around Beatty have a rich mining history, especially to the west at the ghost town of Rhyolite. I was here to chase down a number of peaks described in Zdon's guidebook as well as some P1Ks. I had spent the night at the old Carrera ruins (also described by Zdon) not far from the start of the day's first effort. This P2K is a small range unto itself, much like Eagle Mountain in Death Valley NP. Like Eagle, the rock on Bare Mtn is primarily limestone which generally makes for good scrambling thanks to sharp rock edges which provide superb grip. Even the limestone talus and scree is easier to climb than similar stuff made of granite, shale or other minerals. The hike from the west involves more than 2,000ft of gain but is relatively short, about 2mi one-way. I was happy to find that I could drive the van to the starting point described by Zdon, and was marching off by 6:30a, hoping to get most of the elevation done in cool, shady conditions. I started up the road traversing north as described by Zdon in his route description. Where it reaches a highpoint before dropping down into the next drainage I paused to consider his route advice. Zdon's route continues on the road, dropping a couple hundred feet before heading east up another drainage to the north. But why not simply head up from the road's highpoint, along what would be Bare Mtn's West Ridge? I had guessed that perhaps it was fraught with cliffs or similar obstacles but as I stood there looking at it, it seemed a reasonable route. So up I went to find out. It was a good route as it turned out, primarily limestone scrambling with some solid class three if one sticks to the ridge (there was only one or two places where I couldn't follow the ridge directly). Most if not all of the class 3 could be avoided by dropping some to one side of the ridge or the other, usually the south side. It was a more direct route as well, getting me to the main crest just south of the highpoint. In all I spent just under two hours to reach the top. A Gordon/Barbara register had been placed in 1978 with some 35 pages filled, not surprising considering its P2K status and relatively easy access. The most recent entry was a month prior, by the other CA dynamic duo, Sue & Vic Henney. Oh, and the one before that was the CO duo of Jennifer and Gerry Roach. A 1949 USGS benchmark is also found at the summit with views stretching out, well, not that far because of haze today, but one can certainly get a good feel for the lay of the land around Bare Mtn in all directions ( N - E - S - W). Flush with the success of what I thought was an improvement on Zdon's route, I wondered if a more direct route couldn't be used directly down to the TH. This would involve following the West Ridge down for about half a mile, then dropping left into the drainage south of the West Ridge. This route as well proved quite usable. The upper part is shallow with a gentle gradient, the middle part is steeper, narrower and rockier, and the lower part is a more interesting scramble. I kept expecting to find an impasse in the shape of a dry waterfall, but around each corner the difficulty never increased above easy class 3. The only exception was at the very bottom where I found the difficult dry waterfall I'd been expecting. I managed to downclimb half of this with a few tough class 3 moves, but the final 10ft were more than I could handle. Luckily there is an easy bypass to the north which goes steep class 2 and I used this to finally emerge at the mouth of the wash a short distance above where I parked the van. The whole descent took only an hour. This P1K gets no mention in Zdon, essentially part of Bare Mountain but separated by Secret Pass. 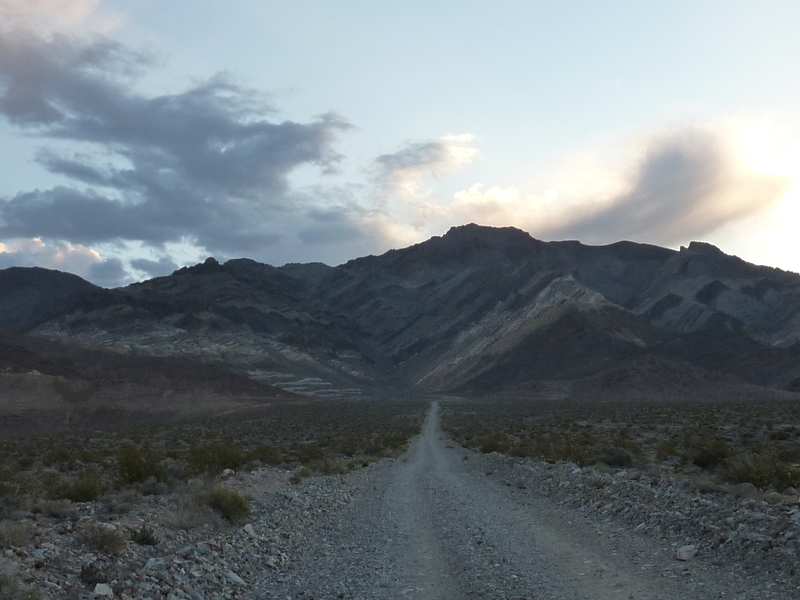 A good dirt road, unsigned, leads to Secret Pass from US95 about a mile south of Beatty. The road leads to a communications facility on a small summit just southwest of Secret Pass. Where it forks to go over Secret Pass the road becomes rougher and I decided not to take my chances. I had gotten with 1/6mi of the pass and within 2/3mi of the summit so I wasn't going to complain, having shaved almost 5mi off the distance from the highway. The hike itself took just over an hour, up one route, down another, both class 2 with just over 1,000ft of gain. John Vitz had left the register in 2012. Interestingly, all five names from four visits that are listed on the single page can be found on listsofjohn.com. This small peak overlooks the town after which it was named on the east side. It rises to a little over 4,000ft with under 400ft of prominence. Not on anybody's peaklist, it's really just a freebie off the same road I used to access Meiklejohn and the hike is even easier with just over 700ft of gain and less than a mile to the summit. A combination of old mining/OHV roads and burro trails will get one to the summit by any of a number of options. A rusting Gremlin lies along the road south of the peak near where I started. Perhaps a warning not to try and drive the van closer to the peak. I was surprised to find a register on what must be a very popular peak for locals. It was left only two weeks earlier by Terry Flood. I rather doubt it will last very long. As one might expect the summit provides a good vantage point from which to take in the town to the west. There's also a good view of Bare Mtn to the south. The whole outing took less than 40min, roundtrip. This P1K is the highpoint of the Bullfrog Hills found northwest of Beatty. The remains of Rhyolite, an old mining town are found on the south side of these hills. Sawtooth is home to an array of communication towers and consequently has a road leading to them, starting from the pavement leading to Rhyolite. I was able to drive the van within a mile of the summit, the last section of road far too steep for ordinary vehicles. Upon reaching the towers, I was surprised to find the summit was actually hidden behind the towers, a large rock outcrop that poses a challenging scramble. I found two different routes, both of which were solid class 3. The ascent route started up directly behind the towers, passing through a notch to the west side before going up a 20-foot crack. Someone had used the old survey tower wire as a handline in the crack but this wasn't really necessary and I thought it was more in the way than helpful (I subsequently rolled it up and left it near the summit). Once atop this crack, the rest is a much easier scramble. A register was left in 2001 by the Mt. Tamalpais Hiking and Climbing Club. 13 pages were used for entries numbering about once per year, though mine was already the third visit for 2015. For the descent route I downclimbed a spicier groove on the south side whose hardest move was at the very bottom. Fortunately, the rock was fairly solid all over the outcrop. From the bottom of this crack I traversed easier slopes on that side back to the towers and then back to van, taking a little over an hour for the outing. Zdon describes an easier class 2 route around the south and east sides of the rock outcrop, but I had failed to note this before my visit. This easy summit can be accessed from the same road used to reach Sawtooth. Both are described in Zdon's guidebook. From the parking spot at a 4-way junction, it is a straightforward hike of about 1.5mi along an easy ridgeline. A handful of mules near the start had spotted me and moved off almost before I could get a picture of them. A more interesting sight was that of a gopher snake that had caught and killed a mouse. It had the mouse firmly intertwined with its body when I almost stepped on the pair. I had hoped to get a picture of it feeding when I returned but it had apparently left the scene of the crime, dragging its victim with it. Along the way it is necessary to cross over a barbed-wire fenceline that seems oddly out of place in this desert landscape until one realizes it marks the boundary of Death Valley NP and was built to keep the feral burros out of the park. Barbara and Gordon had left the register atop Bullfrog's summit in 2008. Most of the other names in the 7 pages I recognized as the usual suspects. While I didn't find my mouse-killing snake on the return, I did come across a second, smaller snake, looking somewhat forelorn and in need of his own meal. They are burros in CA, too. I misused the word 'mule'.